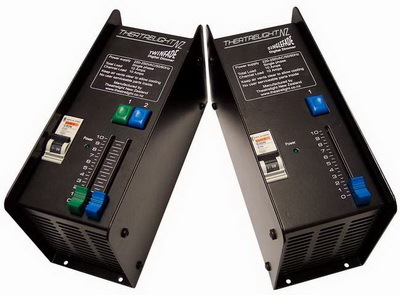 The Theatrelight PID II is a general purpose Plug In Dimmer cabinet designed for TV and Film Studios, Theatres, Concert halls, or any venue requiring an intelligent and reliable dimmer installation. The PID II design supersedes the original Theatrelight PID Dimmer, and is based on software and hardware designs already well proven in the Theatrelight products Nebula—a 3u high rack-mounting professional dimmer pack, and Meteor—a wall mounting Stage or Environmental dimmer. Users familiar with these products will find the menu system and key setup of the PID II intuitive and easy to understand. The new design uses distributed multiple micro-processors, each bin of 6, single, dual or quad modules having a separate microprocessor for maximum reliability. All dimmer parameters in each bin microprocessor are easily set up by the user interface keys and LCD at eye height. 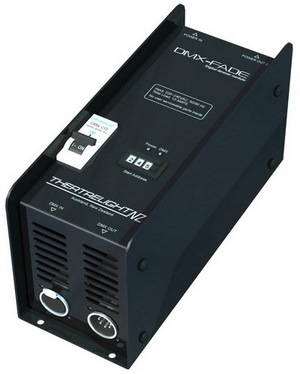 The redundant power supplies have a proven history in Theatrelight’s previous designs. Each of the the two DMX inputs per cabinet present only one, 1/10th standard load to a control panel. The PID II can also be fitted with DMX-over-ethernet communication systems for use with Artnet standard control panels, or an optional RS485 system for use with remote keyplate lighting controllers, or as control, reporting, and monitoring gateways. The PID II is available in a number of versions: 5 bins, 8 bins, and 10 bins per cabinet, each bin carrying 6 plug-in modules. Each module may be of 1, 2 or 4 SCR dimmer channels, with the system planned for future introduction of IGBT and Sinewave dimmer modules. PID II firmware is available in a number of different configurations, and with different communications hardware and software according to customer request. DMX over Ethernet (ArtNet compatible) may be fittted as an option.The space saving design needs only front access for all installation and maintenance, allowing the cabinets to be sited against the dimmer room walls, or back to back. While the PID II dimmer cabinet offers software patch per dimmer to allow maximum flexibity in saturated dimmer installations, a hard patch system may sometimes be dictated by budget restraints (but of course only if the hard patch system saves money over a dimmer per wayline design). The PID II Patch has been designed to provide an economical and space saving alternative to the high costs involved in supplying and wiring a hard patch system using other forms of plugs, sockets, and cables. 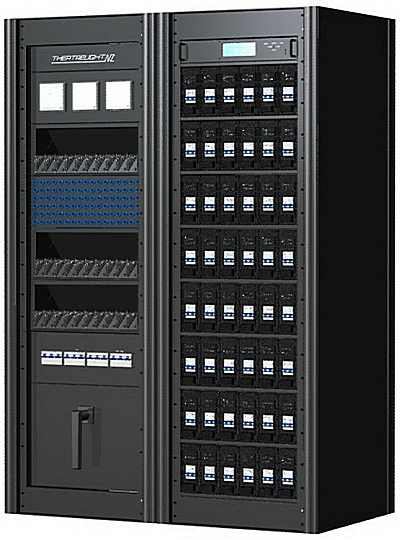 The sample cabinet at right is shown fitted with a 96 dimmer patch socket panel, 3 bins of 60 patch plug-cords (180 outlets/waylines), ammeters, independent power MCBs, and a mains isolator for the 96 PID II dimmer cabinet. Cabinets can also be supplied empty where the same style is required for other switchgear or equipment. PID II Patch Panels are configured to customer specification. 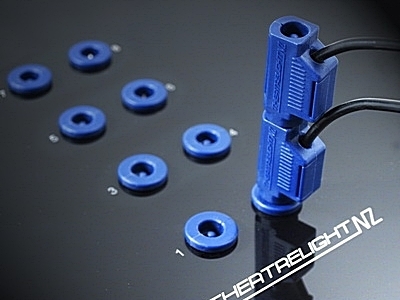 The Theatrelight patch plug and socket (also used in the Theatrelight Tourmaster) are designed to comply with the NZ Electrical (Safety) Regulations 2010, to comply with the IEC 60309-1 Ed 4.1 standard (Plugs, socket-outlets, and couplers for industrial purposes), and to comply with the IEC 60309-4 Ed 1.0 standard (Switched socket-outlets and connectors with or without interlock). Please consult the electrical regulations in force in your country before ordering. 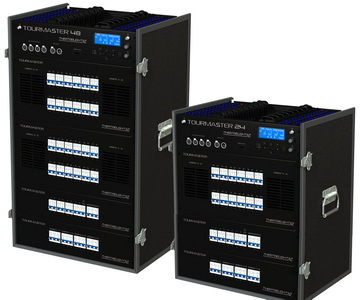 Theatrelight's Tourmaster freight-saving touring dimmer cabinet is available in 24 or 48 dimmer versions, with or without stackable hard patch system. In addition to its light weight, the Tourmaster’s compact footprint of 600mm square and its universal power supply make it ideal for international touring. Dimmers are rated at 4Kw at 220-240vac (2kw at 110-120vac). On hardpatch versions, any of the multicore connectors can be patched to any dimmer or hot power outlet with stacking patch plugs. 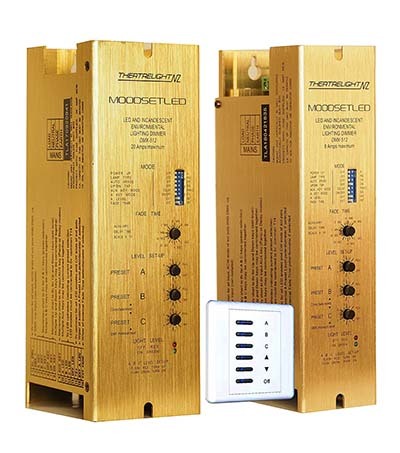 Connector standard is Powerlock mains inputs, with Aust/NZ 3 pin sockets or Socapex multicore outlets. Other versions can be supplied on request. The Meteor meets the increasing need for control of environmental and architectural lighting for power saving and mood effects with the same control features as the Nebula, but in a wall mount cabinet for permanent installtion. The cabinet has easy access for supply and load wiring with convenient cable duct exits at the top and the bottom of the cabinet. 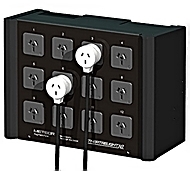 Two matching outlet panels are available for the Meteor - a sockets only panel carrying 12 sockets, useful with an externable patch cord system, or a built-in 12 to 24 waylines patch system using Tapon plugs patching into the 12 dimmer sockets, with an additional 3 socket for independent power. 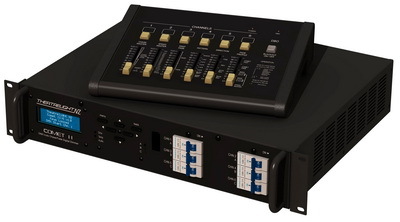 The Meteor may be controlled by DMX, or by intelligent wall plate controllers, building management computer, or by DMX-over-Ethernet (Art-Net, ShowNet, or Streaming ACN) using the Theatrelight ED2 receiver. Simple to set up and use, the RackPack II has all the functions necessary in a simple and reliable dimmer for Theatres or Television studios. It is fitted with an isolated DMX input and a 0-10 volts analogue control input. 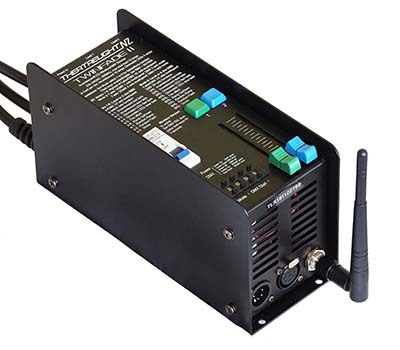 The wide mains supply voltage and frequency range allows the Rackpack II to work in any country. With a wide range of features at an affordable price, the Rackpack is ideal for touring or permanent installation. The Rackpack-Switch adds a permanent power switch to every dimmer of the original popular RackPack I. With the switches On, permanent mains power is provided to nondimmable loads such as DMX controlled LED luminares, moving lights, smoke machines and motors. With the switches Off, the RackPack-S operates as a normal incandescent dimmer. The simple setup of the Rackpack-S makes it particularly suitable for schools and hire use. With tough glass filled nylon handles and a sturdy steel case, these portable packs are ideal for schools and theatre, and for touring and hire use. The range now includes a dual channel 60 amp pack, and a single channel 120 amp pack for film and TV lights, both fitted with an additional manual fader control. These models also feature an extended soft-start time designed to extend the bulb life of 12 Kw and 24 Kw Fresnel luminaires on TV and film sets. The Quasar digital dimmer has many of the features of its big brother the Nebula, but built into either a smaller 2 U chassis for mounting in 19 inch racks, or as a compact Wallmount unit for permanent installation in smaller venues. It can be supplied in two software models: entertainment and environmental, and a number of output configurations: 6x2.5 Kw standard with socket or terminal outputs, or 12x1Kw in terminal versions only. The Quasar can be controlled by DMX, intelligent wallplates, or building control computer. 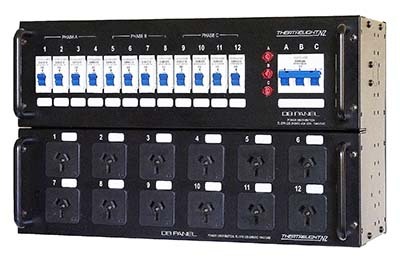 Theatrelight’s updated Satellite II is a general purpose 6 channel dimmer for use in clubs, small theatres, touring troups, or any venue requiring a simple reliable dimmer. The new LCD version is even easier to use, and provides the enhanced features of its larger cousin the RackPack II, but in an economical 6 dimmer pack. The Theatrelight Comet II is a 6 channel dimmer pack with a chase-fade generator and a built-in microphone to provide a wide variety of fading chases and sound-to-light effects. The chase and sound to light functions can be remotely controlled by the Comet 6 controller, making the Comet II ideal as entertaining lighting background to clubs and dance parties. The automatic pattern generator is also suited to window displays, exhibitions, and sign lighting. The new model is fitted with blue LCD with white backlight. Easy to set up and use, the Contact 12 provides switched power via DMX control with user settable security delays, or auto sequential power on for Moving Lights, LED luminaires, fireworks, motors, and any other appliance requiring reliable On/Off power. The Auto Sequential On mode is particularly useful where large installations of LEDs and Moving lights trip MCBs when all circuits are switched on together. 30 amp rated Omron relays provide longterm reliability. The Contact 12 is available in 10 amp, 3 pin socket or terminal versions, and 20 amp Socapex or terminal versions. The SwitchPack DMX is a reliable DMX controlled mains power supply for LED luminaires, moving lights, and other inductive and capactive loads. It is available in three versions: SwitchPack 1210 (12 channels at 10 amps), SwitchPack 1220 (12 channels at 20 amps) and SwitchPack 630 (6 channels at 32 amps), with terminal or a selection of socket backs. The standard 19 inch rackmount case contains either 6 or 12 Solid State Relays for remote switching of loads by DMX control. Solid state relays generate very little electromagnetic interference compared to hard switched Relay contacts. 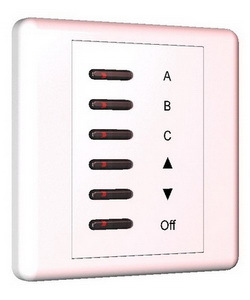 On or Off states may be controlled by DMX remotely, or locally from the internally lit front panel pushbuttons. Universal power supply: 90-240vac, 50-60 hertz. The DB Panel is a front access only version of Theatrelight's popular DB Pack. the DB panel is designed primarily for wall mounting, but the units can also be rack mounted, or used as a portable pack. 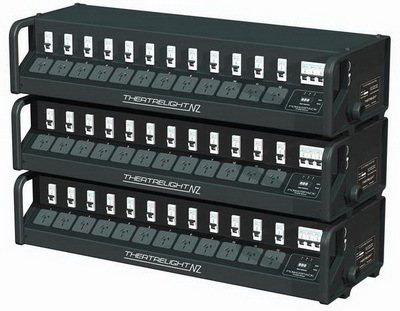 The Twinfade II is a two channel portable dimmer suitable for a wide range of lighting control in theatres, TV studios, film sets, and exhibition and display lighting. It has dimmer curves for both incandescent and mains dimmable LED bulbs, and a range of automated lighting effects such as Fire, Ramp, Random Flash and Strobe. 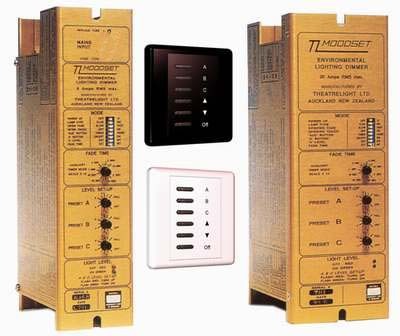 The SingleFade and Twinfade standalone digital dimmer modules are ideal for controlling small incandescent and inductive loads. They feature a circuit breaker and the same reliable SCRs and chokes as used in our other dimmers. A number of units can be used side by side to form a small lighting control centre for location or studio lighting, exhibitions, and theatres. They are small and compact and their rugged construction enables them to withstand the rigours of touring. The single and dual channel DMXFades are stand alone portable dimmers in the same chassis style as the Singlefade and Twinfade, and are ideal for controlling isolated lights by DMX. They also have a variety of automatic chases and fade chases for standalone display and exhibition lighting. Both models have a total input load rating of 10 amps, and feature digitally controlled dimming with dual SCRs per channel, MCB short-circuit protection, and toroidal chokes for noise filtering to studio requirements. Built-in soft-start circuitry ensures longer lamp life for expensive theatre, televison and film light bulbs. These new versions of Theatrelight's original Moodsets provide smooth dimming of both incandescent bulbs and leading edge mains dimmable LED bulbs. Applications include restaurants, hotel lobbies/ballrooms/chandeliers, museums and art galleries, theatre house lights, chicken sheds, and other industrial and horticultural uses requiring the smooth dimming of large numbers of LED bulbs.